The Ruffwear Load Up car harness is a dog safety restraint that was independently crash tested at MGA Research Corp (an NHTSA contracted test facility). It was tested under the conditions in the Federal Motor Vehicle Safety Standard 213 and comes with all-metal hardware and a universal seat belt attachment. This harness comes in 5 sizes for pets 13 – 42 inches in girth. Unlike other harnesses Ruffwear makes, the Load Up is specifically designed for vehicle travel. The harness was designed to keep dogs secure during sudden stops or movements and to keep them in place to reduce driving distractions. A product of customer demand, it was ergonomically designed to make dogs more comfortable for long road trips. But is the Ruffwear Load Up right for your dog? If you’re already a fan of Ruffwear products, it’s probably a no-brainer. Anyway, we’ll break down the stats for you in this review. It’s not meant to be a walking harness. You can leave it on during rest stops and potty breaks so long as your dog is also wearing a collar you can hook his leash into. The only attachment point is for the vehicle belt to loop through, and it’s on the back side of the harness, next to the dog’s bottom. While this makes it unsuitable as a walking harness, many pet owners felt it secured their larger dogs better than a harness with attachments at the top or middle of the back. It also allowed their dogs to lie down comfortably. Will the Ruffwear Load Up fit your dog? Don’t know your dog’s girth? Don’t just guess at what size you need. Correct sizing is important for safety and comfort. To get an accurate measure of your dog’s girth, use a tailor’s measuring tape, wrap it around your dog’s body right behind his front legs. Keep this measurement recorded somewhere, and measure a few times a year (more for growing puppies) to keep track so you can make sure he’s in a good-fitting harness. If your dog’s girth is at the top limit of one size, Ruffwear usually suggests to go up one size. So if your dog measures 22” (top of XS range), order a S just to be on the safe side. Even if it seems a little big at first, the straps can be adjusted to fit better that way. If they’re already maxed out, you don’t have much wiggle room for adjusting anything. Note: You cannot return the harness if you remove the yellow sticker that’s on it, so keep that on there, especially if it’s new and you’re not yet sure if it will work well for your dog. 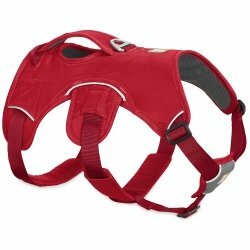 We discovered that several owners bought this as a size upgrade for their ClickIt Sport harness, as they felt the Ruffwear Load Up fit their large dogs better. It also proved to be a good fit for many barrel-chested dogs like whippets. However, for some male dogs, the harness body was too long, resulting in it either covering or rubbing against their private parts. This made going to the bathroom in it near impossible, not to mention uncomfortable to wear. This may be more of a problem for mixed breeds, but it wouldn’t be a bad idea to contact Ruffwear to see if they can give you dimensions for length of the harness body itself. Then measure your dog do see if he’ll be long enough to fit in the harness comfortably. How do you use the Ruffwear Load Up dog car harness? You can attach this harness to your dog and the car in a few easy steps. For visual help, watch the Ruffwear Quick Start Video. Loosen all straps first. To loosen straps on the chest area, just pull webbing through the tri-bar adjuster. To loosen girth straps, remove Velcro tail keepers, unwind webbing, remove slider buckle from metal housing, pull the webbing through buckle, and center the slider buckle on the remaining loop of webbing. Place over the dog’s head. The Ruffwear logo should be on top of the dog’s shoulders. Attach girth straps by inserting slider buckle through metal housing. Tighten straps by pulling webbing through slider buckle. Roll up remaining webbing and attach Velcro tail keeper to hold. Pull tri-bar adjuster on chest area outwards from center to tighten the chest straps. Chest pad should be centered on dog’s chest. Make sure you can get two fingers underneath so it’s not too snug. Put the dog in the back seat. Run the car seat belt through the back loop on the dog harness, and buckle it into the car seat buckle. Check to see that the seat belt is secure. How safe is the Ruffwear Load Up dog car harness? Many people ask why the Ruffwear Load Up isn’t CPS Certified. Ruffwear crash tested this harness in April 2014, which was 3 months before the CPS’s Safety Harness Crash Test Protocol was published. Ruffwear tested this harness at the MGA Research Corp (an NHTSA contracted facility) under the conditions of FMVSS 213, and it passed. Ruffwear discloses all this information on their website, including crash test videos. They even mention how the M and L/XL Load Up harnesses would not meet CPS’s current certification based on head excursion (how far the dog’s head moves during a crash) defined in the CPS testing protocol. 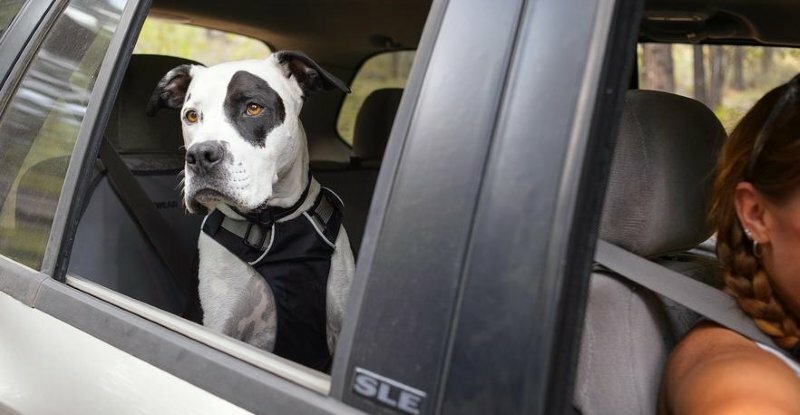 However, Ruffwear says to meet that requirement would mean the seat belt attachment would have to be mounted higher on the dog’s back. They say their seat belt attachment location (lower down the back) is optimal for larger dogs and kept their test dummies secured to the seat better than a higher seat belt placement. To ensure you’re using this harness safely, first get the proper fit. Also, be sure you’re putting it on the dog correctly and hooking it to the seat belt correctly. One owner mentioned that she didn’t realize the harness was on upside-down at first. 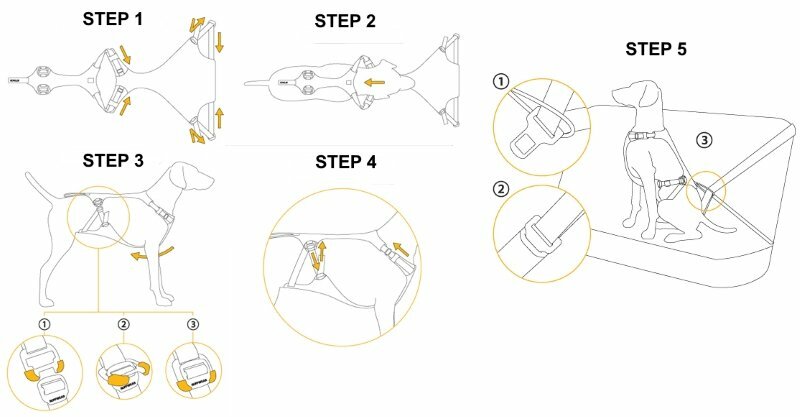 The written instructions can be hard to follow, so follow video tutorials on the Ruffwear site and elsewhere until you are comfortable with hooking it up. Also, some very active dogs got caught up in the seat belt, so this may not be the best choice for a hyper dog. Note: If your dog is a chewer, he can chew through this harness and/or your seatbelt. A crate may be the better option in that case. Unlike the Load Up, the Web Master is designed for off-road adventuring. It comes in 3 colors: gray, red, and blue and 5 sizes (XXS, XS, S, M, L/XL). There is an aluminum ring on the back for attaching a leash. 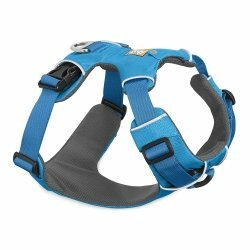 This harness is perfect for working dogs and those who enjoy strenuous hikes. The Web Master has 5 points of attachment for a more secure fit. It’s actually a preferred harness for many avalanche rescue programs, service dog handlers, and amputee dogs. The carry handle on the back is designed to help dogs over obstacles, help them in and out of vehicles, etc. Reflective trim also increases visibility in dark conditions. The bottom clip of the harness can rub against male dogs’ privates. One owner felt the harness leash clip was too far back so that the dog could still pull too much while walking. Some reported that adjusting the harness was difficult while the dog was wearing it, especially a very hyper dog. Owners of Italian greyhounds were happy that this harness was escape-proof. Those with service dogs really love these. There are designated areas for patches and signage to let folks know when your dog’s working. Most complaints were fit-related, but there weren’t many complaints at all. The Ruffwear Front Range harness is designed for everyday off-road use. It comes in 6 colors: blue, green, orange, purple, gray, and pink and comes in five sizes (XXS, XS, S, M, L/XL). There’s an aluminum ring on the back for attaching a leash. This harness is great for everyday walks and light hiking. The 4-point adjustment provides a custom fit for most dogs. It’s not bulky, so it allows a great range of motion for trips to the dog park or playing fetch. It holds up well for dogs that like to pull on their leads. 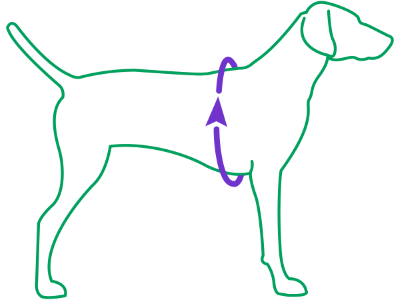 The front leash loop can be used with the back loop for a double ended leash if you need further control for dogs that tend to pull. You have to slip it on over your dog’s head. Some dogs hate that. Escape artist dogs may slip out of this one, since it has some give, even when adjusted to a snug fit. It’s not a heavy-duty harness, so large, powerful dogs and dogs who like to chew could break it or chew through it. Owners liked the ID pocket so you can tuck a dog ID inside where it’s not dangling and making noise. They liked that the edges were soft and that the harness was easy to adjust. Sizing does seem to be off, with the harness running a bit large. Owners whose dogs are escape artists didn’t have good luck with this harness. Other complaints had to do with quality control - ripping, buckles breaking, etc. 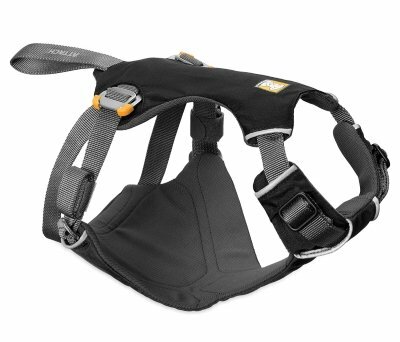 The Ruffwear Load Up harness is a good choice as a safety restraint for most dogs. It has its limitations and isn’t a good harness for walking. It does provide a good fit for many barrel-chested dogs like whippets due to its multiple points of adjustment. Male dogs with shorter torsos, however, may not like it since it might cover or irritate their privates. We’d recommend this one for long car trips rather than everyday, short trips since it is quite heavily built and takes some effort to get it on and off.